Improve worker safety and production. 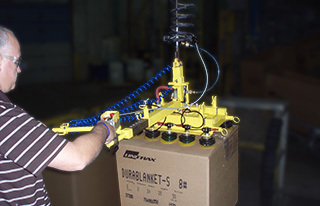 Application: Pick up boxes quickly and safely while keeping the operators in a good ergonomic position. 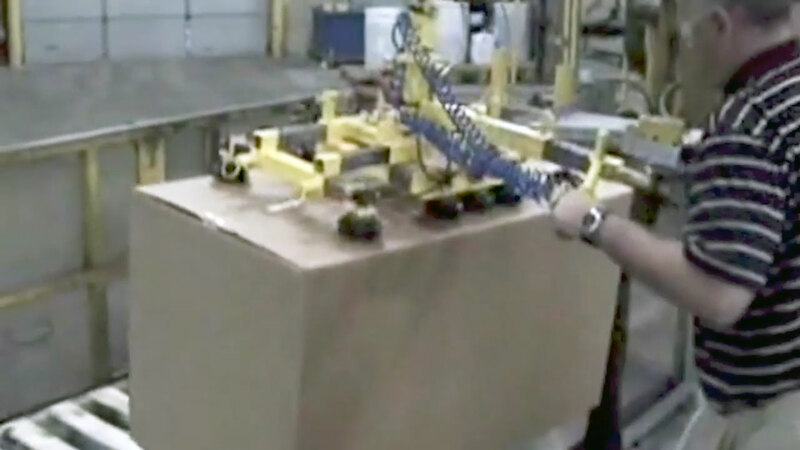 Problem: Customer was palletizing boxes weighing up to 180 pound boxes by hand. The operators were taking the boxes from a conveyor to a pallet roughly 1 foot from the end of the conveyor. The customer installed a pit mount lift table to keep the set down point in a good ergonomic position. The boxes ranged from 2 foot long to 4 foot long making them bulky for the operators to handle by themselves. This was a constant area for operator fatigue and strains. The operators were lifting the boxes anywhere from 2-3 times per minute making it a tough job when high density material was running. The plant has vacuum tube lifters in use, but their lack of success and difficulty to control made a vacuum tube lifter a bad choice for this application. Solution: A custom vacuum lift assist powered by venturi vacuum was integrated with a Gorbel Zero-Gravity PLC controlled hoist (300 pound Gorbel G-Force) Because the boxes varied drastically in size from smallest to largest, the vacuum cups were made adjustable in both directions. Also, the operators had 12 inches of in/out adjustment added to the handle to allow for the shorter operators to reach easily across the pallet to set down the second row of boxes. Because we used an extended handle, a Gorbel G-Force pendant handle was used with the tool instead of a Gorbel G-Force slide handle to give the operators leverage on the tool when it was loaded and unloaded. The lift assist was incorporated with our standard gripper safely circuit, which prevents the part from being released in mid-air. The Gorbel G-Force allows for smooth, quick, and precise lifting of boxes to assist the operators in handling the large loads. Result: The vacuum lifting device integrated with Gorbel G-Force and remote mount handle allowed the use of one operator to handle the several different size boxes. The tooling took a great amount of strain off the operator, and allowed the second operator to tape the upcoming new boxes as opposed to helping palletize the existing box. 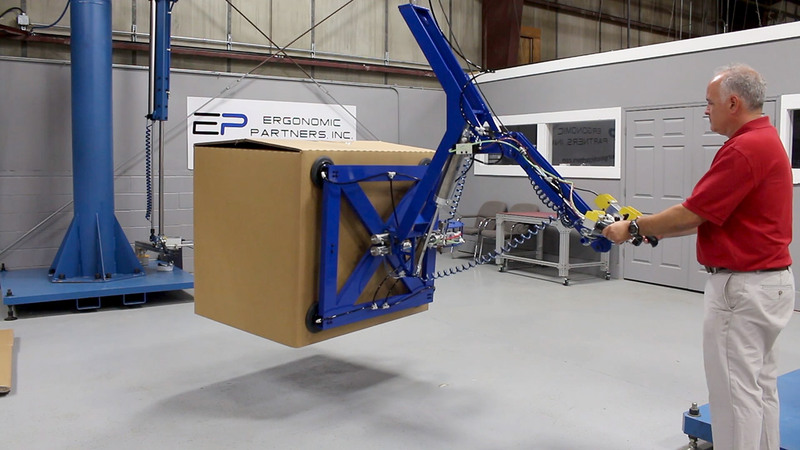 Ergonomic Partners custom solution allows for increased production and reduced strain on the operator. 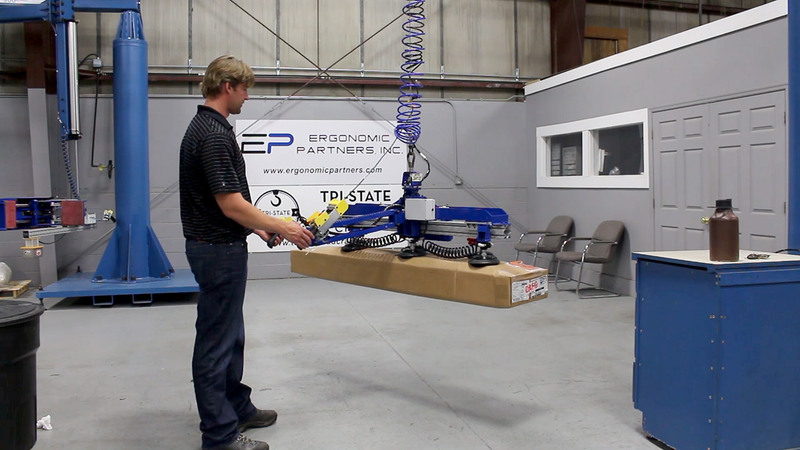 Ergonomic Partners has a LIVE DEMO of this vacuum lift assist and a Gorbel Easy Arm zero gravity articulated arm in our shop. Contact us today. 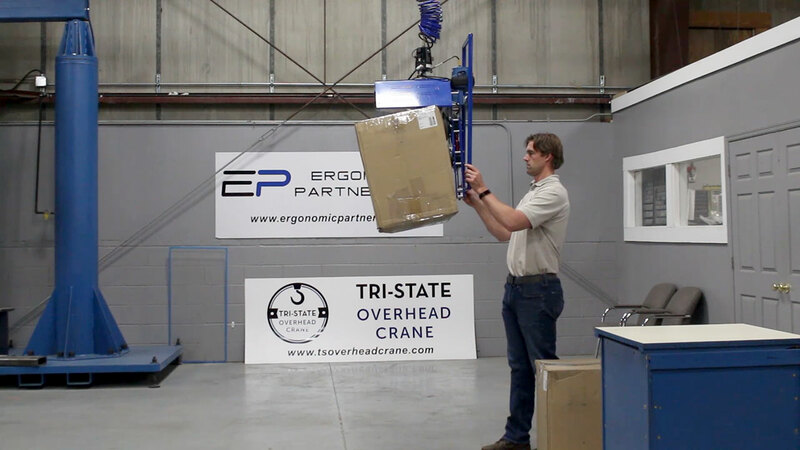 Ergonomic Partners serves and manufactures vacuum lifting devices; serving clients from coast to coast, Canada, Mexico and especially focused in the states of Missouri, Illinois, Indiana, Kansas, Arkansas, Mississippi, Nebraska, Tennessee, Kentucky, Iowa, and Oklahoma.